Big sensors. Hefty price tags. We knew coming into Photokina 2018 that Fujifilm had some big plans for the event, and the company did not disappoint with its announcements. Aside from introducing the Instax Square SQ20, Fujifilm's had two major reveals at the show: the GFX 50R and GFX 100. These are medium format mirrorless cameras, powered by system Fujifilm likes to call Super Full Frame, that come with large sensors and a hefty price tag. The GFX 50R, for starters, is essentially a successor to the GFX 50S from 2017, which was $6,500 when it launched. Inside, it's nearly identical to the 50S, sporting a 51.4-megapixel sensor, 100-12,800 ISO range a 400-shot battery capacity and a weather-sealed body. There are a few changes, however, including a new built-in OLED electronic viewfinder with a 3.69 million dot resolution, Bluetooth connectivity for remote image-sharing and a design that's smaller and lighter than the 50S. 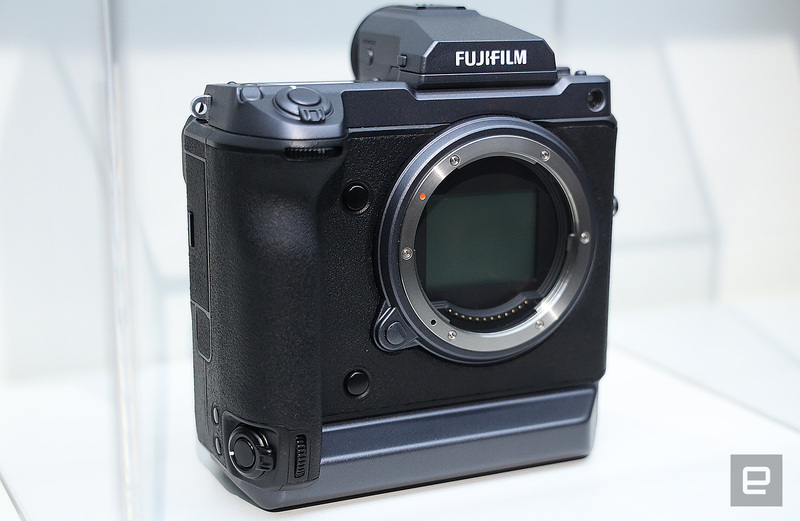 It actually looks rather similar to Fujifilm's X-E3 compact mirrorless camera. The GFX 50S looks massive in your hand, whereas the GFX 50R is less bulky and, most importantly, more comfortable to hold. It's still 775 grams (without a lens), but the 50R just looks so much better with the smaller form factor. Unfortunately, like with the GFX 50S, the 50R is still limited to 1080p video at 30 frames per second -- so this is clearly not a camera aimed at videographers. Fujifilm is confident people will be able to look past that and, instead, focus on the potential of having 51.4 megapixels at their disposal for stills. Personally, I'd rather have the flexibility of a Sony A7R III full-frame mirrorless camera, which is one of the best shooters on the market and costs over $2,000 less than the GFX 50R. It just depends on what you want a camera for, that's basically what it comes down to. Now, if all you want to do is turn some heads (and take some super high-resolution shots), Fujifilm has you covered with the GFX 100. This is a 100-megapixel medium format mirrorless camera, which the company says will cost around $10,000 when it arrives next year. Right now, there aren't many details about because it's still in the early stages of development, but what we do know is that the GFX 100 will have in-body image stabilization and 4K/30fps video. Fujifilm's throwing out a lot of "world's first" claims, saying it's the first medium format and mirrorless shooter to have a 100-megapixel sensor. It also said it'll be the first time ever that 4K movies are produced by a medium format mirrorless. Suffice to say, that should produce some incredible bokeh. Considering how expensive both the GFX 50R and GFX100 are, they're certainly not cameras for everyone, but you can't blame people for getting excited about the potential. The big question whether Fujifilm's strategy to invest heavily in the medium format mirrorless space will pay off, especially while the rest of the industry goes full-frame. For now, Fujifilm seems to be convinced that the GFX 50R and GFX100 are the way to go. Follow all the latest news from Photokina 2018 here!